The Mick Channon-trained Somersby looks handily placed to claim a second Grade One career victory in Tuesday's Champion Chase at Punchestown. With Cheltenham winner Sire De Grugy's season over, Somersby will be a leading fancy for the two-mile feature (17:30 BST) at the County Kildare track. Somersby, second to Sire De Grugy twice this term, will be ridden by AP McCoy. Hidden Cyclone is the likely favourite, while Henry de Bromhead's Sizing Europe runs for a fifth successive year. The race is the highlight of the first day of the Irish National Hunt Festival. Ruby Walsh rides Twinlight for in-form trainer Willie Mullins, who also saddles Turban. On Somersby's chances, Channon said: "He is in good form, we are just hoping for some decent ground for him. Hopefully they won't water too much. "He has won his Grade Two so he deserves to win a race like this. We are hoping we go there with a good chance." Module opposes Somersby again, having finished close behind the gelding at Cheltenham last month and in November's Haldon Gold Cup at Exeter. 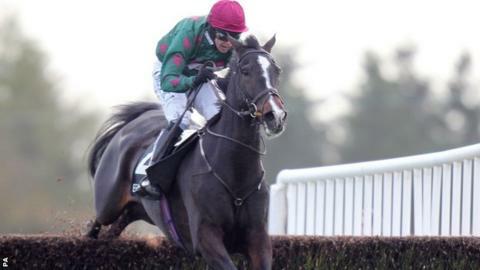 And trainer Tom George thinks the seven-year-old, ridden by Barry Geraghty in the absence of the injured Paddy Brennan, can reverse the form "sooner or later". Hidden Cyclone heads the ante-post market after finishing runner-up to Dynaste in the Ryanair Chase at Cheltenham, his third consecutive second place at Grade One level. Sizing Europe, who posted a creditable fourth in the Champion Chase at Cheltenham, was second to Sprinter Sacre in this race last year. Asked whether this could be the six-time Grade One winner's swansong, trainer de Bromhead said: "I'm just preparing him for the race. We will see how he gets on and go from there." Elsewhere on the card, Walsh's decision to opt for Djakadam has made the Mullins mount favourite for the Grade One Champion Novice Chase (18:40), another highlight of the opening day.